Ductile aluminumdie casting alloy for die castings with demanding requirements in terms of ductility and elongation at failure or with demanding requirements in terms of formability. 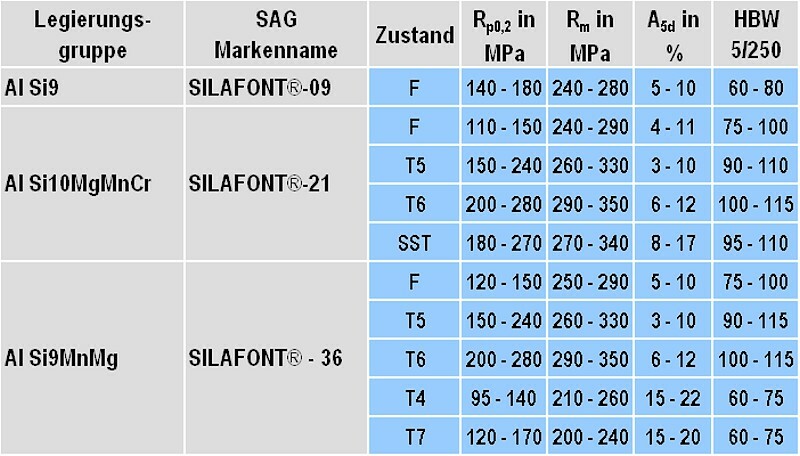 An overview (without guarantee of completeness) of the alloys of this type and their chemical composition is given in Tables 1 and 2. As a near eutecticaluminum-silicon die casting alloy, this alloy displays a very good form-filling ability and outstanding casting properties. Due to the low iron content and balanced addition of manganese, there is no need to fear the tendency to stick, meaning that even complicated die castings can be demolded easily. This alloy is preferred for high-quality castings which require high ductility and high strengths. Due to the high elongation at failure, die castings made of Al Si9 can be subjected to high, dynamic stresses. The alloy is characterized by a very good corrosion resistance against weather and water, can be processed well with machines and is also very polishable. Castings made of this alloy can be anodized. The goal when developing this material was to create the optimum composition which, on the one hand, ensures a low tendency to stick and, on the other, reliably prevents the formation of inclusions. The selection of a balanced manganese to chromium ratio in order to avoid intermetallic diffusions was a key focus in the development of the alloy. These alloy elements prevent sticking considerably and improve the demolding behavior; the modification with strontium ensures that the component has high ductility. By varying the magnesium content, the mechanical properties can be individually adapted to suit the relevant requirements. The alloy has proved to be a brilliantly castable casting alloy in the production of die cast structural parts. In series production the die casting alloy Al Si9MnMg has proved itself due to the practical characteristic of not tending to stick. In the cast condition, high elongation at failure values can already be achieved which can be improved even more for cast components with low amounts of pores and oxides through a heat treatment (Figure 1). With the newly developed, patented SST heat treatment (Silicon-Spheroidisation-Treatment), ductile components with high strength in particular are created with considerably reduced costs for heat treatment. With this quick heat treatment process, the solution annealing time can be reduced to just a few minutes. This is made possible, on the one hand, by sufficient hardness constituents in the forced solution (magnesium silicide dissolved in the α-solid-solution) and the spheroidizing of the AlSi eutectic. The SST process is can generally be used for refined hypoeutectic to near eutecticaluminum-silicone alloys. This means that a very high elongation at failure value and good strength properties are achieved in the casting. The silicone particles present in spheroidized form have an almost spherical formation and influence both the elongation at failure and the endurance strength positively. The process replaces the time-consuming solution annealing process; the rapid cooling and the artificial aging are carried out during the full aging. This process is mainly applicable in casting processes with a higher solidification speed during forming (thixoforming, die casting, gravity die casting). This alloy is an aluminumdie casting alloy with a low iron content and with an adjustable, wide property profile, depending on the heat treatment condition and magnesium content (Figure 2). The alloy is weldable and (as long as a suitable processing technique is used) can be used for structural and safety components. In the cast condition, high elongation at failure values can already be achieved which can be improved even more through a subsequent heat treatment. The strength can therefore be increased considerably with a T6 treatment. 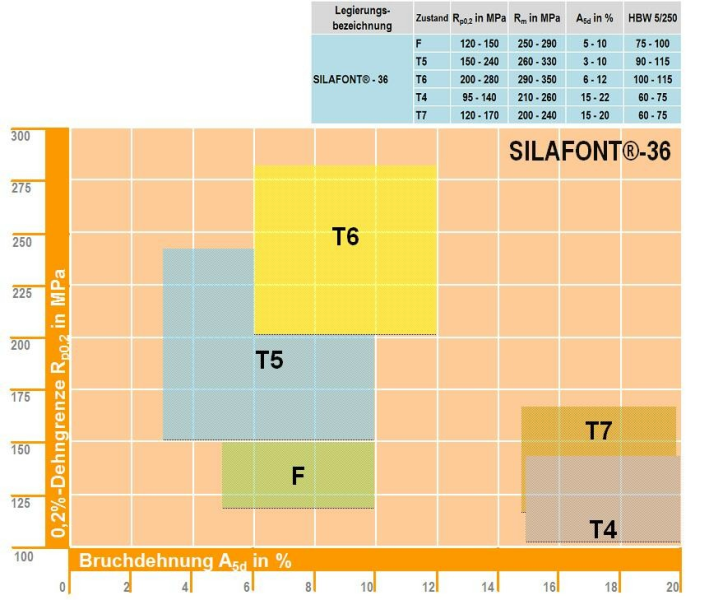 If the castings are made from Silafont®-36 with the standard cold chamber die casting process without the use of a vacuum, its is sensible to use a T5 heat treatment, which increases both the strength and the elongation compared to in the cast state with suitable heat treatment parameters (artificial aging temperature and time). 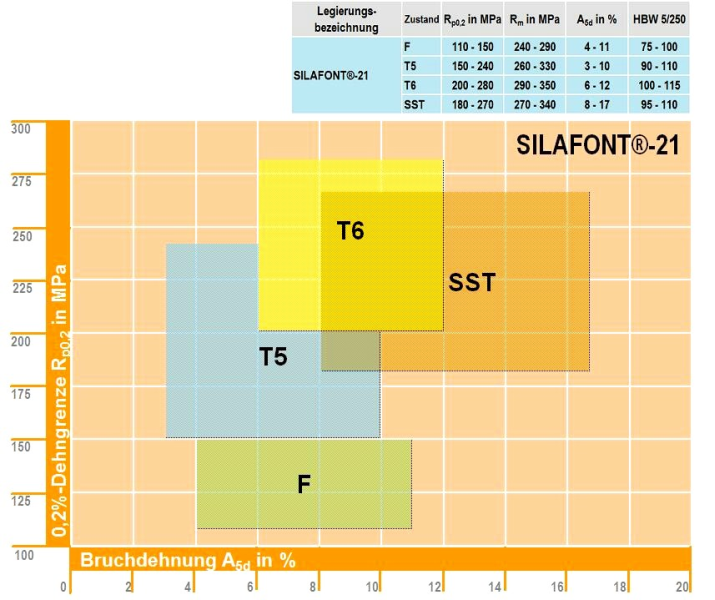 High elongations at failure can be achieved in the component by over-aging with a T7 treatment.